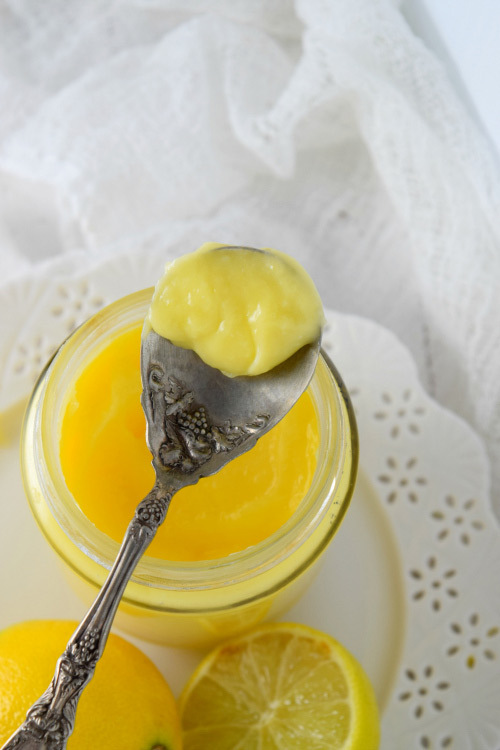 Tangy luscious lemon curd in under 15 minutes! Perfect to smear on scones, biscuits, toasted bread, on top of oatmeal or just eat it straight with a spoon! Lemon curd. As much as I love lemon curd, I have always been scared to make it at home. For one, I always used to think that I will fail at it. Eggs might curdle up, it might not thicken up or worst case it might taste horrible and I would imagine myself throwing it into garbage! Yeah that’s #foodbloggerproblems and well it made me resist for a while but now since lemons are just everywhere, I couldn’t stop myself from getting over my fear and hey it’s really easy! Actually start to finish it takes only 15 minutes and you have a homemade, cost effective, delicious bottle of lemon curd in your refrigerator to smear onto everything. I have been eating it almost daily just plain with a spoon. Darn it tastes amazing. The day I made it I had it for dinner with crepes! Seriously do that! Dessert for dinner is totally acceptable when it’s freezing outside. It’s like spring, fresh and refreshing! I mean you can totally afford to give 15 minutes to this, right?! You can make it in advance and use it for a saturday brunch for your family. Serve with fresh crepes, waffles or pancakes!! Saturday brunch problem solved?! Easy 15 mins Lemon Curd Recipe at your service! 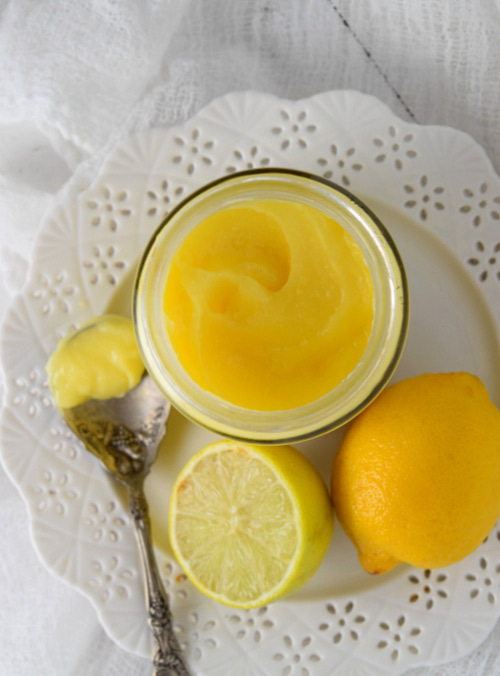 Tangy luscious lemon curd in under 15 minutes! Perfect to smear on scones, biscuits, toasted bread or just eat it straight with a spoon! Whisk together juice, zest, sugar, and eggs in a heavy bowl ( I use a glass or stainless steel bowl). Stir in butter and cook over moderately low heat, whisking frequently, until curd is thick enough to hold marks of whisk and first bubble appears on surface, about 6 minutes (Do it on a double boiler.Just fill a pot with some water and bring it to a boil. Lower the heat and place the bowl with the mixture on top and keep whisking until it starts to get thick). Store it in clean glass bottles or your dish of choice covered airtight in refrigerator. Lemon Curd recipe adapted from epicurious. This curd looks gorgeous, Ami! I had no idea that it was this easy to make! Looks delicious! I love homemade lemon curd! Your version sounds so easy and looks delicious! I had the same doubts when I first made lemon curd lol but it’s really simple! Yours look perfect! 🙂 Have a lovely weekend Ami! Thanks and have a relaxing weekend too! This lemon curd looks perfect—thick and smooth. I could spoonfuls of it from the jar. What a treat to have in the fridge! : ) I love lemon tart and I don’t know why I don’t make lemon curd more often…maybe it’s because I see myself sneaking bites from the jar all the time! Haha I have been doing this all day today!! 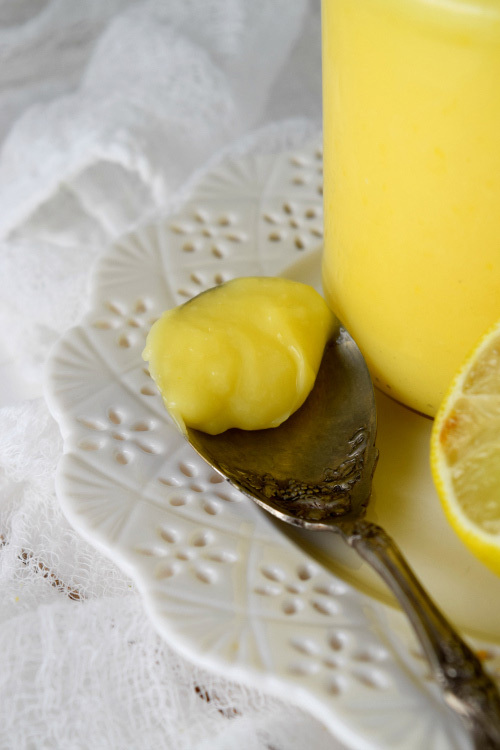 Lemon curd is one of my FAVORITES! Perfectly sour and sweet, I’ll eat it on everything. This version looks perfect Ami! Me too Alyssa – I will eat it on everything! Thanks for stopping by! I feel the same Christina even though I have been eating it straight from the bottle daily!! Ok, would you believe me if I told you I was LITERALLY just trying to find a recipe for lemon curd? You are the best! Thanks for sharing! Awww perfect then!! Hope you like it! Yummy! We have a lot of campfires, and I recently heard that you can make “lemon meringue” smores with toasted marshmallows, lemon curd, and graham crackers. Can’t wait to try this! What?!! Lemon meringue smores?!! I want! Ohhh yes now I am craving hot scones!! 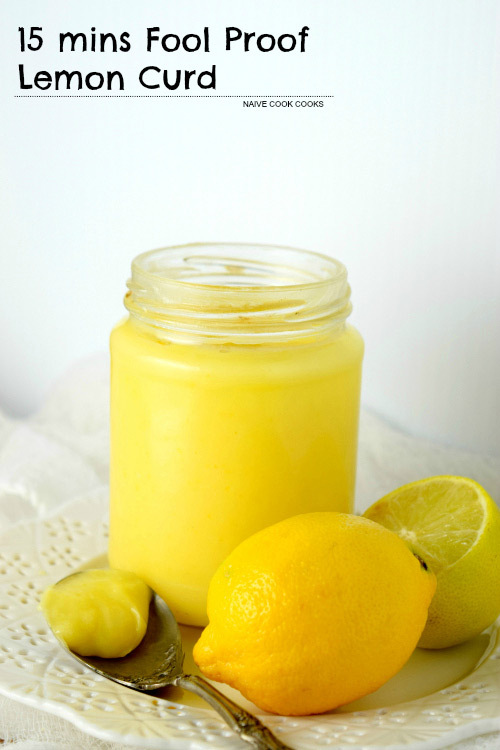 Homemade lemon curd is seriously the best!!! Love how bright and cheery this looks in your pictures!! !